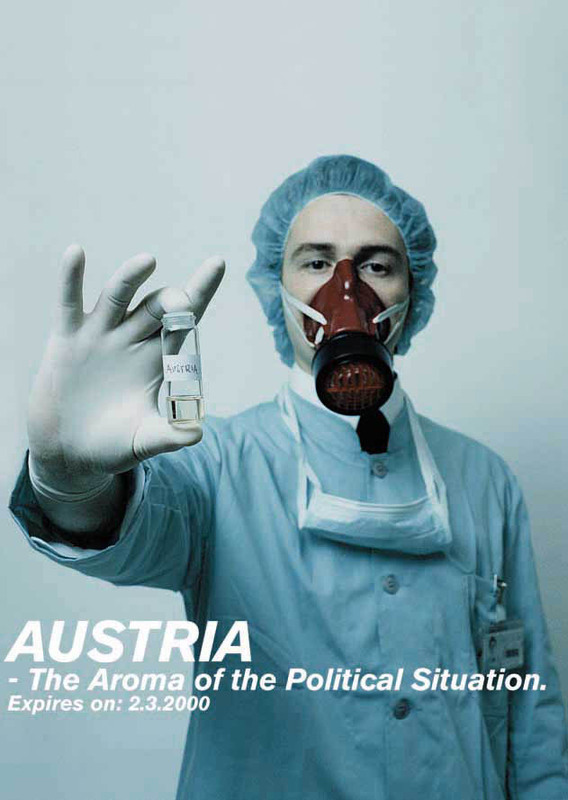 Viennese actionartist Robert Jelinek devotes a specifically Austrian fragrance to the EXPO 2000. The fragrance with the expiry date of 2.3.2000, the day on which the Austrian government was formed, will be exhibited as a 50ml flacon in a shipping container. Due to the intense concentration/dosage contained in the flacon, an invisible olfactory barrier of up to 50 meters will be created at the very center of the EXPO 2000 - thus confronting visitors to the world exhibition with a nasally insurmountable boundary. Only outside a radius of more than 100 meters is the original topnote of this specifically Austrian fragrance revealed. Already two years ago, Robert Jelinek and his ultra-mobile Viennese label Sabotage Communications caused an international stir with "CaSH - The Scent of Money." CaSH corresponds to the fragrance of a freshly printed US $100 bill and was distilled by Sabotage into specially-created flacons (50ml, unisex, Eau de Toilette). Coming soon: EURO-notes with various national aromas will be available. The scent of the Euro will hit the shops as a vacuum-sealed banknote and is intended for use as an air freshener. With their current project "AirConditions," an olfactory exhibition throughout the city of Vienna (11-17 September 2000), Robert Jelinek and his team disclose new nasal pathways and try to revitalize an aesthetics of scent.